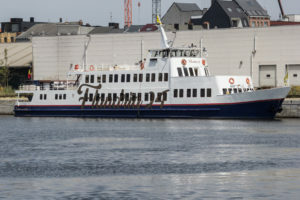 Flandria 24 (44m long) has a maximum capacity of 250 people. In its almost 100-year history, the Flandria 24 has undergone many changes. 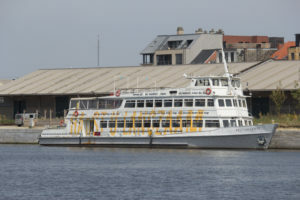 More than one million tourists got acquainted with Antwerp, the Scheldt and the port aboard this boat. In the meantime, the Flandria 24 has been thoroughly refurbished and today it equipped with all modern comforts to provide tourists with an unforgettable experience on the water. The Flandria 24 is ready for many more years of cruising fun. The entire ship is also wheelchair friendly. Festina Lente literally translates as “make haste slowly”, but do not forget to enjoy. This 42m long ship has two large open outdoor decks and two cosy and stylish interior lounges with bar and dance floor. Festina Lente provides the perfect setting for any corporate party, seminar, trade show or exhibition. She accommodates 150 people in a dinner formula or even 200 people for receptions and parties. Absolute top class. This ship, too, is wheelchair friendly. Feel free to contact us for formulas and prices.